Here you will find an overview of all NAT-TEST related events, from applying for the exam, to exam day itself, all the way through to when you receive your results. The start of the application period and deadline are the same all throughout China for all testing locations. Starting on the Monday two weeks before the exam at 9 a.m., you will be able to download your application ticket from the application website. Please print this out on an A4-sized piece of paper and bring it with you to the exam. After you have completed your application, we will send you the application ticket to the specified mailing address and e-mail address. You will receive this as late as one week before exam day. If you have not received your application ticket, please contact us. Please arrive at the testing location by the time that is specified on your application ticket. As a rule, levels 1, 3 and 5 of the exam will take place in the morning and levels 2 and 4 will take place in the afternoon. Once you have entered the testing location, please follow the directions of all proctors and staff members. In order to uphold the integrity of the exam, we will confirm the identity of each examinee before the test begins. Please bring a valid photo ID with you to the exam. Language Knowledge (reading, vocabulary): 25 min Language Knowledge (grammar), Reading Comprehension: 50 min, Listening Comprehension: 30 min * The exact time allotted for the listening section may differ slightly based on the length of the recordings. The NAT-TEST uses a mark sheet that you will record your answers onto. When you choose an answer, fill in a dark, solid, circle with your pencil (dark pencil types such as HB and B are acceptable) so that the designated area is completely filled in. If you fill in two or more circles, punch through the answer sheet, or lightly fill in an answer, the question will be marked as incorrect. If you are going to erase an answer, make sure you erase your mark completely. If we are unable to clearly determine your intended answer, the question will be marked as incorrect. Good job! 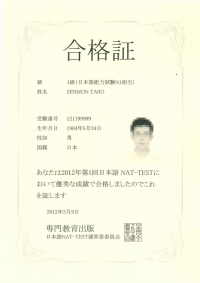 You have successfully taken the NAT-TEST. Make sure you haven't left anything behind and have a safe and pleasant journey home. And don’t forget that you may not take the question booklet with you. Within 3 weeks of the exam date, we will send a score report to all examinees. Your strengths and weaknesses on the test will all be visible at a glance. This will also be useful to help guide you along in your future Japanese studies. For those who pass, a certificate of proficiency will be issued along with the score report. 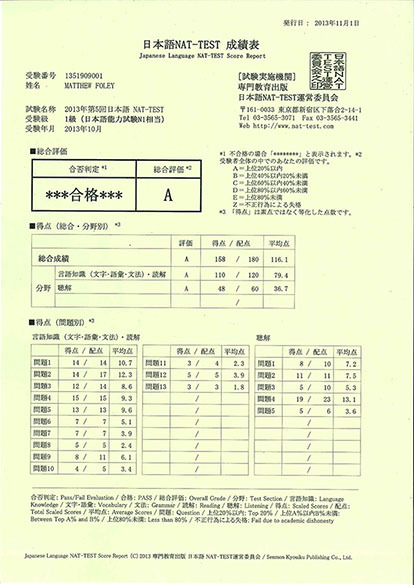 This is shows that you have passed the examination and can be used to as proof of your Japanese language ability.